The rhythmic, regular beating of the heart is controlled by a natural cardiac pacemaker called the sinoatrial node. This small patch of cells sends rhythmic bioelectric impulses along specific conducting fibers to the heart muscle. These impulses stimulate the muscles to contract and relax in a regular sequence. If the heart muscle fails to receive the pacemaker's signals, it will not pump the blood. With no blood reaching the brain, lack of oxygen will quickly cause an individual to lose consciousness. Within a few more minutes, the individual dies, unless the heart muscle is stimulated to resume its beating. The idea of using electric impulses to restart the heart goes back at least as far as 1862. The first practical idea was that of American inventor Wilson Greatbatch, who envisioned an implantable pacemaker in 1951. His idea, however, could not be practically implemented until transistors became widely available in the late 1950s. In 1960, after two years of animal testing, Dr. William Chardack and his associates implanted Greatbatch's device in the chest wall of a human patient. 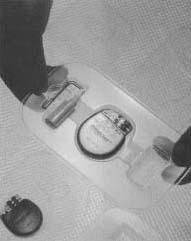 Today's pacemakers can weigh as little as one ounce (30 grams) and are relatively easy to install. Pacemakers operate only when episodes of irregular heartbeat occur. They can be programmed to vary the heart rate according to the body's needs. So, for example, a slower heart rate is programmed during sleeping hours. In situations where a pacemaker is only needed for a short time (such as when a person's heart rhythm is temporarily disturbed by a heart attack), the pacemaker's generating unit can be worn externally on a belt, rather than implanted. Design of modern pacemakers has continued to improve. Modern lithium batteries last up to 15 years, while earlier mercury-zinc batteries had a life of only 20 months. Today's pacemakers can weigh as little as one ounce (30 grams), and are relatively easy to install. Were two pacemakers ever installed in one patient at the same time? (Or one pacemaker installed, then another added later.) I have a friend who claims her father had two pacemakers, one on the left side of his chest, the other on the right. This sounds bogus to me.